Reliance 4G VoLTE JioPhone feature phone with a 2.4-inch QVGA display and square design. It has an alphanumeric keypad along with a dedicated button for torchlight. The smartphone supports all languages, and users can speak to the device via voice commands. The company is giving people an option to browse Internet on the new JioPhone as well as pre-loaded Jio apps and users can watch movies using the JioCinema app. The phones have a headphone jack, microphone, speaker, supports FM Radio and it comes loaded with features like expandable SD card slot, 4-way navigation and more. 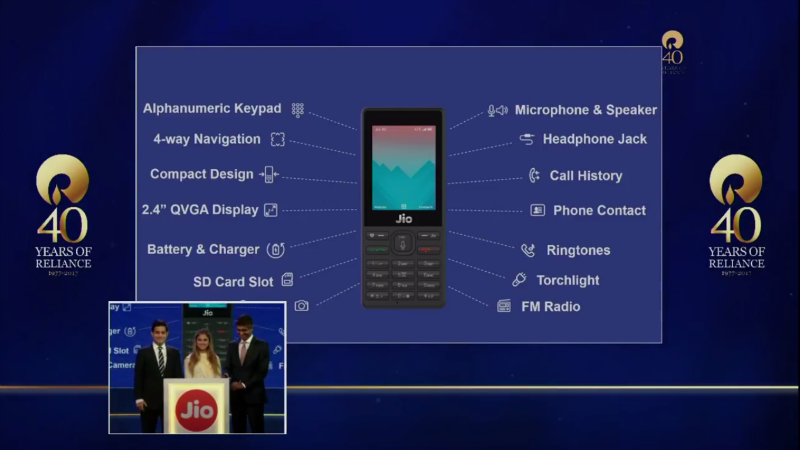 The phone also comes with NFC support as per Jio, users in future could use it to store their credit/debit card details to make payments, something like Samsung Pay.